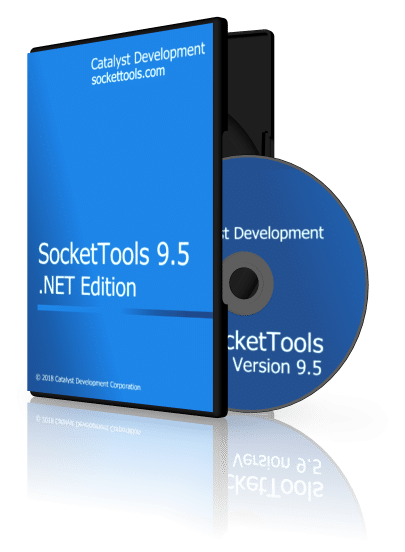 The SocketTools .NET Edition is a collection of managed .NET classes, designed to simplify the integration of Internet functionality into applications built using Visual Studio or Embarcadero RAD Studio. Developers using C# or Visual Basic can quickly create applications and services for both 32-bit and 64-bit platforms, adding features like file transfers, remote command execution and sending email messages. Integrated support for SSL/TLS and SSH enables strong encryption without any complex coding requirements. Recommended: Developers using C# or Visual Basic with Visual Studio, Embarcadero RAD Studio or SharpDevelop. Requires the .NET Framework 2.0 or later versions. The SocketTools Library Edition includes standard Windows dynamic link libraries (DLLs) which can be used in a wide variety of programming languages. It includes native 32-bit and 64-bit DLLs and uses standard Windows API conventions for broad compatibility. The Library Edition is ideal for the developer who requires the high performance, minimum resource utilization and flexibility of a lower level interface, without the inherent overhead of the .NET Framework or ActiveX controls. If a language can call native functions exported from a DLL, then it can use the SocketTools libraries. Recommended: Developers creating Windows desktop or server applications using languages such as C/C++, Object Pascal, Visual Basic, PowerBASIC and Clarion. The SocketTools ActiveX Edition includes ActiveX controls (OCXs) which can be used in a wide variety of development tools such as Visual Studio, Microsoft Office (VBA) and dBase Plus. Any language that can use ActiveX controls or COM objects can use the ActiveX Edition controls. The ActiveX Edition is ideal for the developer who requires the flexibility, ease of use and rapid development features of a component. SocketTools covers it all, including uploading and downloading files, sending and retrieving e-mail, remote command execution, terminal emulation, and much more. Recommended: Developers using Visual Basic 6.0, Microsoft Office (VBA), dBase Plus, Visual FoxPro, PowerBuilder and other languages that can use ActiveX controls.